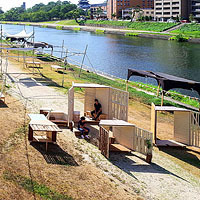 A town plannning project in Takamori town. This project aims to create new circulation and activities in the area that includes the small station in the town. 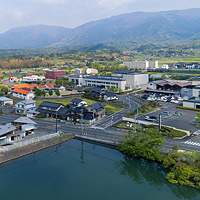 A town plannning project in Nagi town. 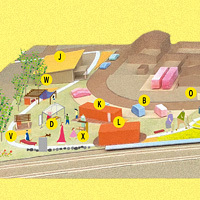 This project aims to visualize the future of the town after 50 years. We found the circular path that runs in the town and would connect the public facilities of Nagi town. New public facility for Nagi town in Okayama prefecture. 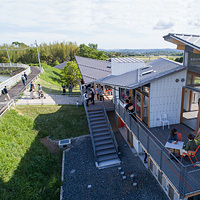 It's designed to be the central community space for the local people, based on Nagi Town Grand Design. The building is located along the bank of the reservoir that is one of the local identity of Nagi town. The building is devided into 3 small volumes and shifted each other so that the building has various small spaces in bothe of the exterior and the interior. And the pedestrian ramp penetrates the building, connecting the front yard plaza and the pedestrian deck of the reservoir bank. This project aims to activate the existing public spaces by the traveling spacial device. This device is composed of 7 furnitures of various sizes and shapes. An apartment building for 9 families in a suburban residential area. Taking advantage of the low-density district, the building has many exterior dwelling places. The three-dimensional mass with several void spaces was designed using wind simulation. 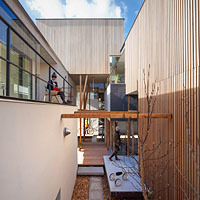 The exposed structural wooden frames are not only supporting the floating mass but also working as exterior furniture. The annexes in the ground floor would be used as a space for non-residential use, such as home office, lecture class etc so that their life would be connected to the surroundings.